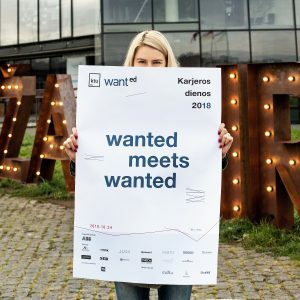 This Wednesday, October 24 the biggest in the Baltic States job fair Career Days 2018: Wanted meets Wanted takes place. 140 companies and organisations will introduce themselves to thousands of young job seekers. The visitors of the Fair will be able to explore career opportunities in 3 different areas: Career Zone will accommodate booths of companies and organisations, Innovation Alley will introduce various innovative solutions, charismatic speakers, successful businessmen and society figures will share their insights during WANTed Talks conference. The full programme of the event is here. “During the event the students can not only find a permanent or temporary job position, but also agree upon the topic of their final project, which would be both interesting and practically applicable in a real life. This is a career contact fair – students can approach companies with any questions; the event presents a stage, where anything can happen”, says Lina Slavickaitė, Head of Partnership Development and Career Centre. Career fair offers vast opportunities for job and internship seekers. Just imagine – although it is impossible to visit 140 companies in one day, in a job fair you have a setting which makes this achievable. Moreover, to get a job interview, you would usually have to send tens of CVs, whereas in the fair you can just introduce yourself to people in the company booth. Plus, the fair allows you to put your face to your CV and thus be much more persuasive in your job hunting. In order to maximise your opportunities, please browse through the list of companies and devise a strategy – choose and prioritise the ones you want to visit. Polish your CV, tailor it to a number of possible job opportunities and be ready to ask the potential employer a question or two – remember, a job is many things, such as company culture, atmosphere, colleagues and opportunities to learn. This year, in order to make networking more efficient, Career Days organisers are introducing an electronic system for exchanging contacts – smartbadge. Having a smartbadge a student or a graduate will not need a paper copy of their CV, their information will be provided electronically to the potential employer. In order to get the smartbadge you need to register here. The slogan of the event – “Wanted meets wanted” – suggests that this is the place for the best job providers in the market to meet the most sought after employees. Don’t miss your chance.